There isn't exactly a library in the original television production of Tinker, Tailor, Soldier, Spy. Early in the series, the various three-piece-suited sociopathic spymasters have a conversation about creating one to protect information gathered by their high-level Moscow source. Later, Smiley's inside man Peter Guillam steals a folder from MI6's library-like archive repository. Proponents of the theory that the librarian archetype is always negatively portrayed on-screen will find rich pickings here. The hunched, ugly, frumpy and frowning archivist with glasses the size of saucers keeps a watchful eye from behind a table littered with library stamps and ledgers (a more attractive encardiganed blonde shelves folders). The regulations tacked to the back of the door are torn, the light is dim, the air is dusty. And you can steal top-secret folders, just like that. 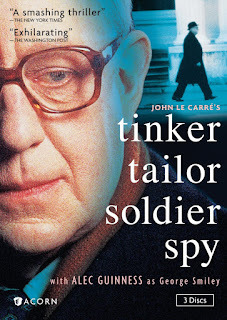 If you want to read my thoughts on the 2011 film version of Le Carré's book, follow the link at right, or click here. "Encardiganed" is my new favorite word. I am myself encardiganed right now. I hadn't realized that it was a new coinage - I never thought I'd be the source of a Googlewhackblatt (I see that someone - you? - has been searching for it on Google). Looking forward to seeing a dictionary entry in 20 years time. I am appalled to find that I too am currently wearing a cardigan. But it doesn't have sleeves, so I'm going to insist that it's a waistcoat. I *love* cardigans -- it's all in the attitude! And over here, I think we'd call what you were wearing a "sweater vest" (of which my husband is fond) but I do love that English word "waistcoat"... it sounds formal yet cozy at the same time. And back to the subject of your blog post, I am now on the hunt for the original miniseries from my local libraries. We recently saw the 2011 version, and I'll do a post about my initial reaction/thoughts about it soon.